Arbory Afloat shouldn't be as good as it is. 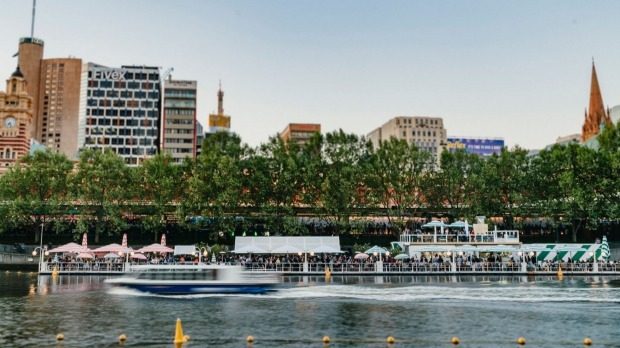 We're talking about a restaurant and bar for more than 400 people serving a pretty lengthy menu of Italian staples (including wood-fired pizza) all being executed from a pontoon floating on the Yarra. Yes, the Yarra. No one expects to have a nice time on Melbourne's brown baron. But from 11am until 1am every day of the week the sunbeds are stacked and the gin bar is frothing. But that's probably not the big surprise. 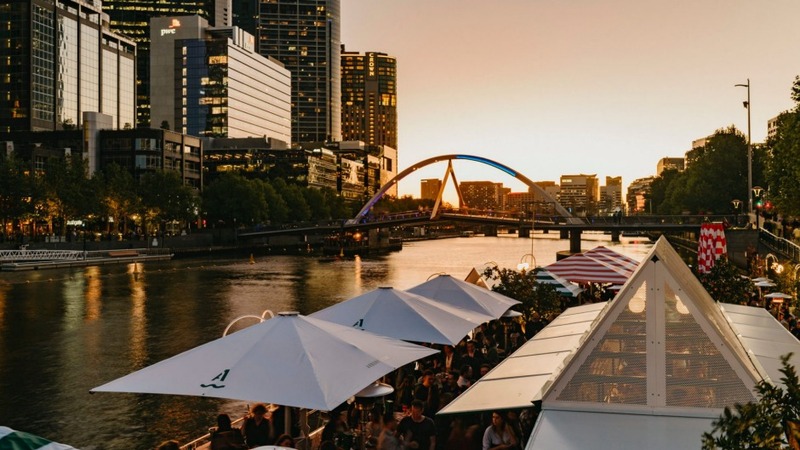 Melburnians react to warm weather like animals, or Londoners, ripping off shirts and rushing any rooftop or courtyard at the first sign of sun. We'll pay stupid money for mediocre drinks and food so long as we get a picturesque perch. Playing it cool is for cities with reliable barometers and legitimate tans. What chance did we have against Arbory Afloat's arsenal of striped umbrellas, sunbeds, fruiting orange trees and on-water location (right behind transport/tourist hub Flinders Street Station)? They could be serving airplane crackers and make a killing. Plot twist: they aren't. Arbory Afloat has substance. Yes, you have to pay at the bar and gather your own cutlery and condiments. Sure, if you order appetisers, mains, and desserts together they'll arrive whenever they're damn well ready (take that as advice to stagger your ordering unless you want dessert first). But what hits the table is surprisingly slick for being cooked in a galley. To be fair, it's quite the set up, including a giant wood-fired pizza oven, and executive chef Nick Bennett has form delivering good food in venues where others would go for a cash grab. He made Trocadero (RIP) at Hamer Hall a legitimately compelling restaurant. Now, across the river, his Italian doughnuts from this raft's partying-on-the-Amalfi-Coast menu are some of the city's best. Made like a cross between choux pastry and croquettes, they're fluffy, cheesy, creamy clouds captured in a crisp shell with a punchy pesto blanco of ricotta, walnuts and garlic, all showered in pecorino. 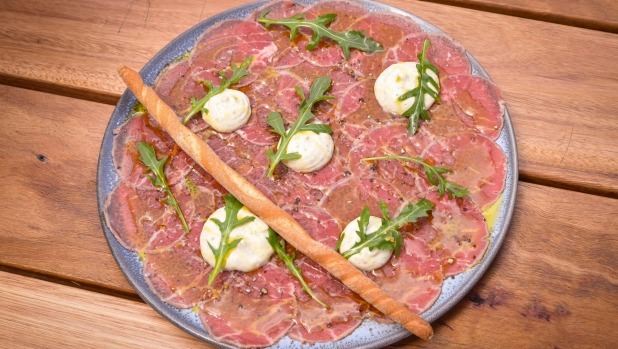 Another winning mash-up, beef carpaccio, is textbook in its tissue paper delicacy, bolstered by a properly hefty tuna mayonnaise. They could have picked a riper rockmelon as the base for our prosciutto, but those waves of salumi are of the good San Daniele variety. So far so simple, but the nicely scorched Neapolitan-style pizza measures up. Our fatty, sharp and creamy union of crisped up pancetta, green olives and fior di latte works well enough that I'd willingly take on the porchetta and crackling number next time. The fish and chips are also excellent, juicy flathead fillets in a puff of batter and pickle-forward tartare. The chips? Brought in, given they go through 450 kilograms a week (the weight of a racehorse), but they are good, skin-on versions. That's the thing. Anyone who's worked in events or big venues (or just eaten in them) should appreciate this as a triumph of logistics (and of not cutting corners). While things aren't always hitting the table in the right order, and we have to chase a couple of dishes up, everything is landing nicely presented and fresh. An army of wait staff swarms the decks like ants, clearing and carrying. You aren't going to get provenance details. You are going to get lunch. 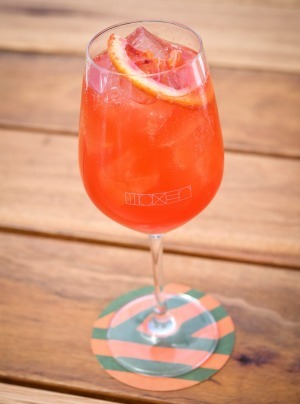 The cocktails are all things you want to drink in the sun – Aperol or blood orange spritzes; a lengthy menu of craft gin and tonics; and a fluffy watermelon situation that constantly keeps the party soundtrack of a blender humming. Many have been smartly pre-batched on tap so you get them quickly and at the right strength. The wine list has some exciting action, local and international, straight and funky, curated by the Good Food Guide 2018 Sommelier of the Year Raul Moreno Yague. A couple of wrist slaps are owed. A caprese made with dull tomatoes is always a crime against Italian (someone needs to manage that incoming produce when they're serving purist dishes), but the dressing of fresh mozzarella, chopped olives and capers will be a winner on good fruit. And something has gone awry with our massive shared pasta. Bouncy scallops, mussels and squid tangle with spaghetti in a broth lacking sparkle, seasoning and fat to round it out. A shame, as this dish, starring lobster last year, was a cracker. Maybe get a big old platter of crayfish, prawns, oysters and king crab leg for $85 instead. Other caveats apply. Yes, it's loud. Yes, it's rammed. The amount of purse-lipped posing might be unbearable. But if you're writing Arbory off as just for cool kids, corporates and tourists, you might miss the party of the summer. Don't. Pro Tip: You can book (amen), for tables, sunbeds and the new upstairs deck. 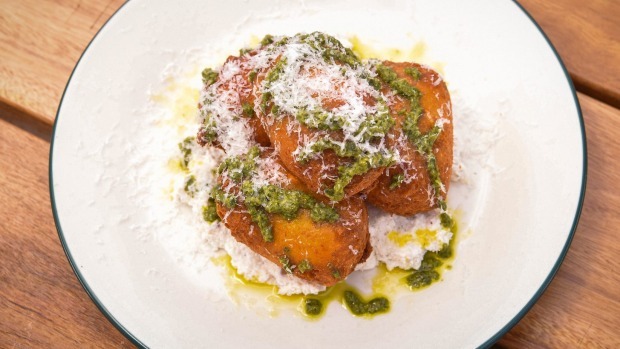 Go-to Dish: Italian doughnuts with white ricotta pesto ($14).